Reduce your revision workload today! Add and personalise any YouTube video in less than 30 seconds! TuitionKit has been a positive addition in regard to the process of using videos to support our class assessments. Having TuitionKit fitted in well with our own classroom resources. TuitionKit is a treasure trove of video-based tuition for learning core school subjects. But it's more than that; we have proven interactive tools to aid learning and teacher tools to help teachers interact with and track their students. As an educator, empower your learners by giving them control of their revision schedule and topics. TuitionKit is a resource created for teachers by teachers and offers a range of digital content designed to keep learners engaged and help them revise effectively. Our teacher features make tracking progress, setting learner-specific tasks and lesson planning a matter of minutes whilst allowing for the creation of innovative and engaging tasks. In April and May 2016 over 1,500 students were using TuitionKit for over an hour each night as part of their revision. 100% of respondents to our questionnaire said that TuitionKit was a ‘great help’ and that they got the grades they wanted. We currently have over 14,000 subscribers in 13 different countries! With school-wide subscription packages, students can access our GCSE and A-Level materials from home, or elsewhere on a mobile device, or on their school computer. More frequent use and virtually no admin from the school! The subjects we cover are GCSE Maths, English, Chemistry, Biology, Physics and A-Level Maths and Biology. Engage students with clear and precise expert content! Enhance the content provided within school, be it through video use in class, revision and study materials for students, flipped learning initiatives, assistance and lesson preparation materials for cover supervisors and expert help for those absent or in isolation. We prepared some guides for you to get a more detailed understanding of how TuitionKit works. This gives you a quick snapshot of all the key features that TuitionKit has and allows users to do. This sheet is a great starting point for teachers who wish to use TuitionKit to help their students. 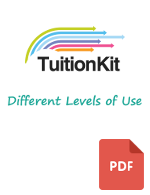 This sheet gives you considerations of the depth to which you can use TuitionKit. You may want to use a different level of features with different classes.